Habibi (centre) and police officers with the confiscated items from both cases. KOTA KINABALU: Four Sarawakians, including a husband and wife, may face the death penalty when they were caught with a total of 455grams of syabu worth RM50,000 on Tuesday. City police chief ACP Habibi Majinji said the suspects, aged 19 to 42, were arrested following a tip-off of a drug transaction taking place at a restaurant in the city centre around 6.40pm on September 11. 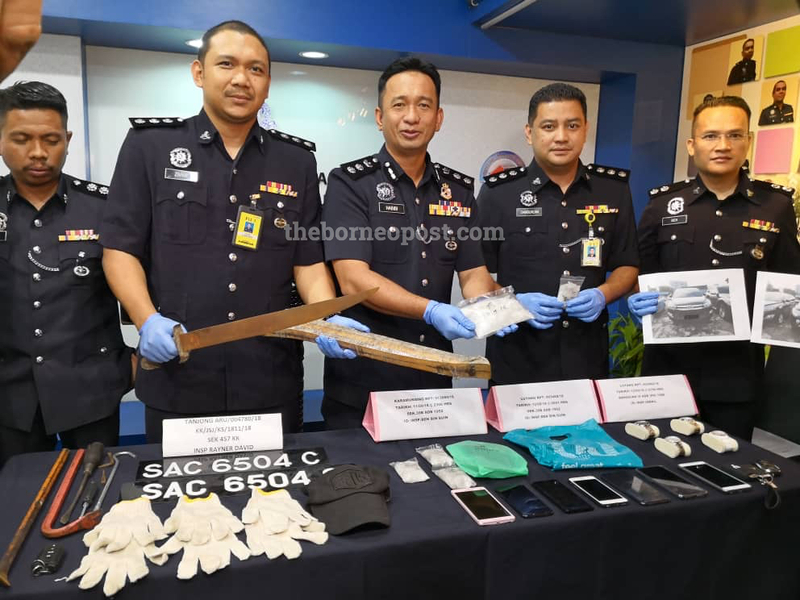 “The first arrest were made against two men at the restaurant where police found three small plastic packets that contained crystal like substance believed to be syabu. “Interrogation of one of the suspects then led police to a condominium in Luyang the same day. “Search inside the premise found two plastic packets, one large and one small, which contained crystal like substance believed to be syabu,” he said, adding that the couple who was inside the condominium was subsequently detained. Habibi said investigation revealed the total drugs weight at 455grams with market price at RM50,000. Police also confiscated a Mitsubishi Triton, a Toyota Innova, four luxurious watches, seven cell phones and three bank book. The suspects have been remanded for seven days and the case will be investigated under Section 39B of the Dangerous Drugs Act 1952, which carries the mandatory death penalty upon conviction. Meanwhile in an unrelated case, two men were arrested by police for their involvement in numerous house breakin cases around the state capital. Habibi said the suspects, in their 20s, were arrested following a high-speed chase along Jalan Menggatal around 5am on September 12. “Police initially spotted a suspecious blue Proton Bezza car in Menggatal and as my men approaches, the vehicle immediately speed off. “Police then chased after the vehicle until Jalan Sulaman, near 1Borneo Hypermall, where we managed to apprehend the suspects. “Inspection inside the car found several items such as a machete, crowbar, screwdriver and gloves. “Investigation also revealed that the car was a rented vehicle but the plate number have been change to prevent detection by authority,” said Habibi. Police investigation shows the suspects have been involved in numerous house breaking cases around the state capital. The suspects will be remanded for four days to be investigated under Section 457 of the Penal Code for housebreaking.